Angela and I are back in Shanghai and getting adjusted to being on a normal working person schedule. Although it would be great to be on vacation all of the time (and some of our relatives think that we indeed are), it is nice to be back into a routine. Angela has all new administrators, and is adjusting to a newly implemented schedule. I no longer teach any guitar classes, and get to teach just band without having to share the band room anymore. It is a tremendous relief for me to stay in the same room all day, every day, and get to teach band for every class. I am finding myself much more comfortable at the start of this year than in previous years. Angela is the lower school specials leader this year, and I am the 6th grade team leader. That means we are both extremely important people. Overall, it has been great getting back to our apartment and our life, and seeing all of our wonderful friends. We recently did something that I have wanted to do for a very long time. It was our friend Juliet’s birthday, and for her birthday she wanted to go to a classy afternoon tea. 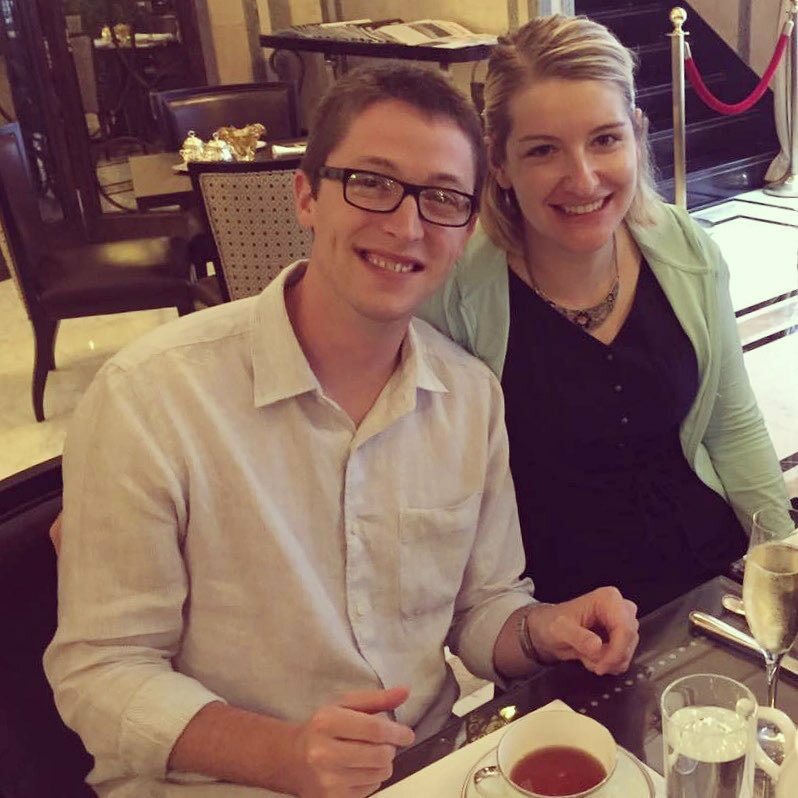 Being an American, I have never been to afternoon tea as a meal or activity, so I was excited to try it. I was also excited that afternoon tea was going to take place at the Fairmont Peace Hotel. This is a really old, classy hotel on the Bund, and also home to the ‘Old Jazz Band’, which is Shanghai’s oldest jazz band. All of the members were in their 80’s, and had been playing together for many years. I have wanted to hear them play since we arrived in Shanghai. Angela and I enjoying our very first afternoon tea. 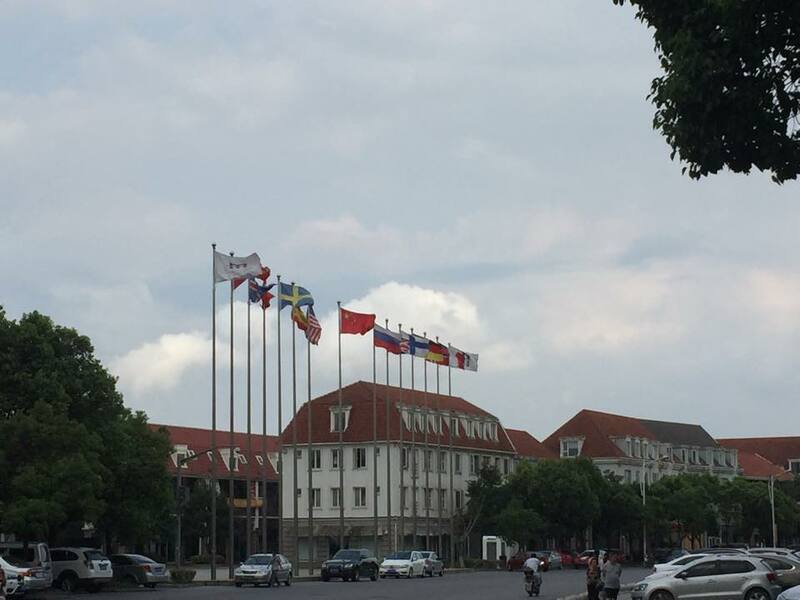 Last weekend, I went to the Shanghai American School on the Pudong side of the river to help with their band day. The middle school students were practicing their honor band music, and the 5th graders were just starting out on their instruments. It was a fun day, and I got to meet a few new band teachers in Shanghai, which I always like to do. While I did that, Angela went to an event called Sip ‘n Paint with a few friends. The idea behind Sip ‘n Paint is that you drink wine with your friends while painting. Sounds like a pretty solid way to spend a Saturday! Angela’s masterpiece is pictured above. Pretty good, especially considering all of the wine. 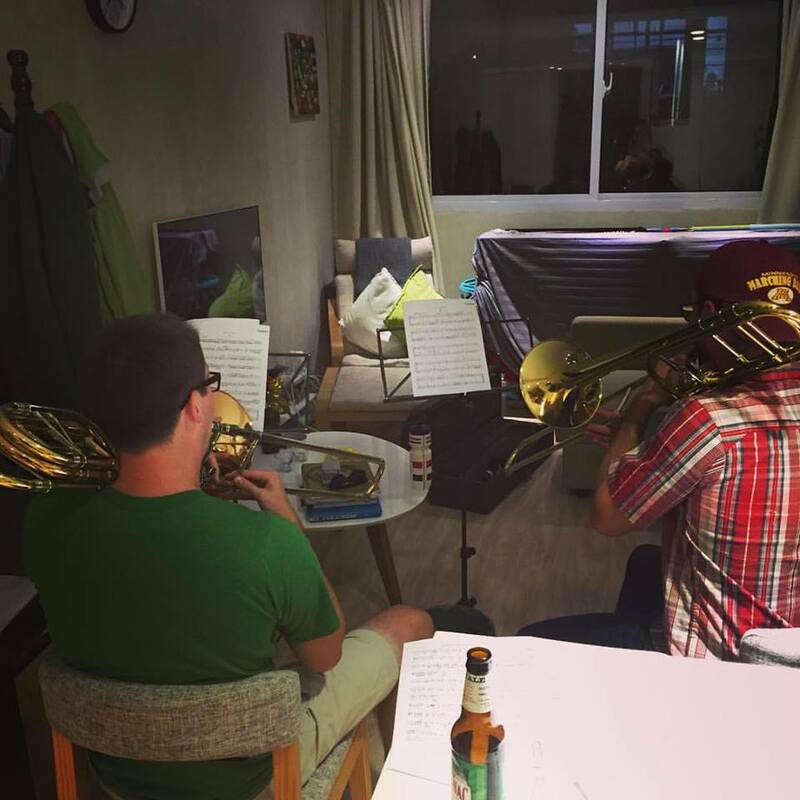 Later that night, one of the new teachers at SCIS, Austin, came over and played trombone duets with me at our place. He is a classroom teacher, but has his minor in music from the University of Minnesota. Austin actually stayed at my house a few years ago when we lived in New Hampton because he was attending the job fair at UNI (where Angela and I secured our Shanghai job) and we lived about 40 minutes away. Austin was a high school classmate of Jake, my roommate when I lived in New Hampton. He got a job in Kuwait and that job fair, and now he has moved to our school. Small world! The lower school went laser tagging last week, and because I had an in with the lower school, I went too. It was possibly some of the most fun I have had ever. We arrived early, and they made us wait in a really strange room, pictured below. Eventually we left the creepy room in which we half expected someone to come out with a tray of cocaine, and found a foosball table where we proceeded to play versus a group of young Chinese people. It was a lot of fun. Eventually a few other people showed up, and we played three intense games of laser tag. 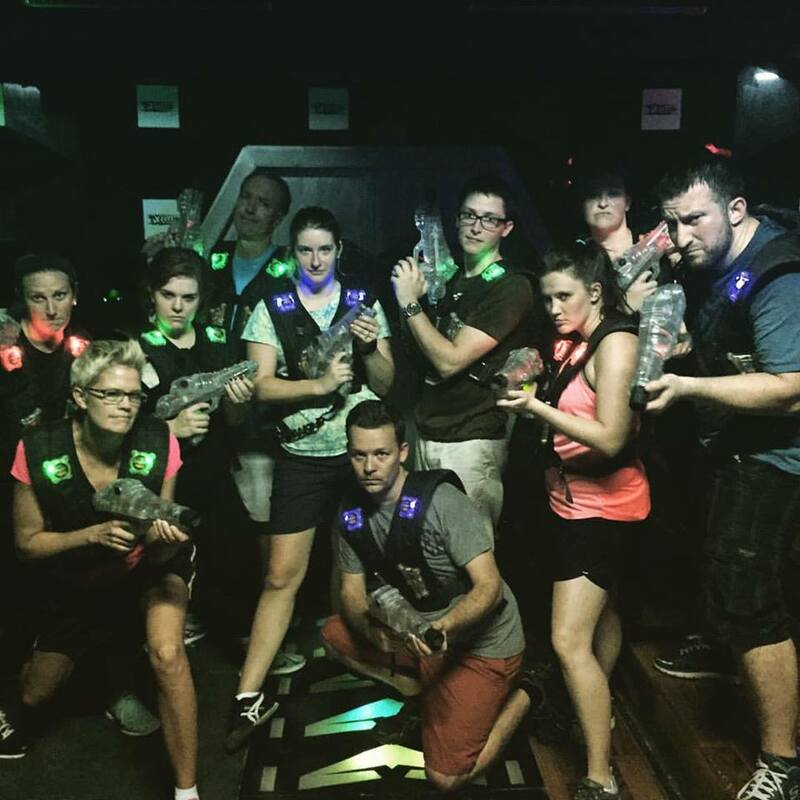 If you aren’t familiar with laser tag, you shoot lasers out of a gun at other people and score points. It is a beautifully simple game. Today, Angela and I wanted to do a little exploring. After coming up with a few ideas, we decided to take one of the subways to the end of the line, and see what was there. I looked over my subway map, and saw that subway line 7 ended at a stop called ‘Meilan Lake’. We figured that this was a winner, and proceeded to take the 50 minute subway trek out to the end of line 7. 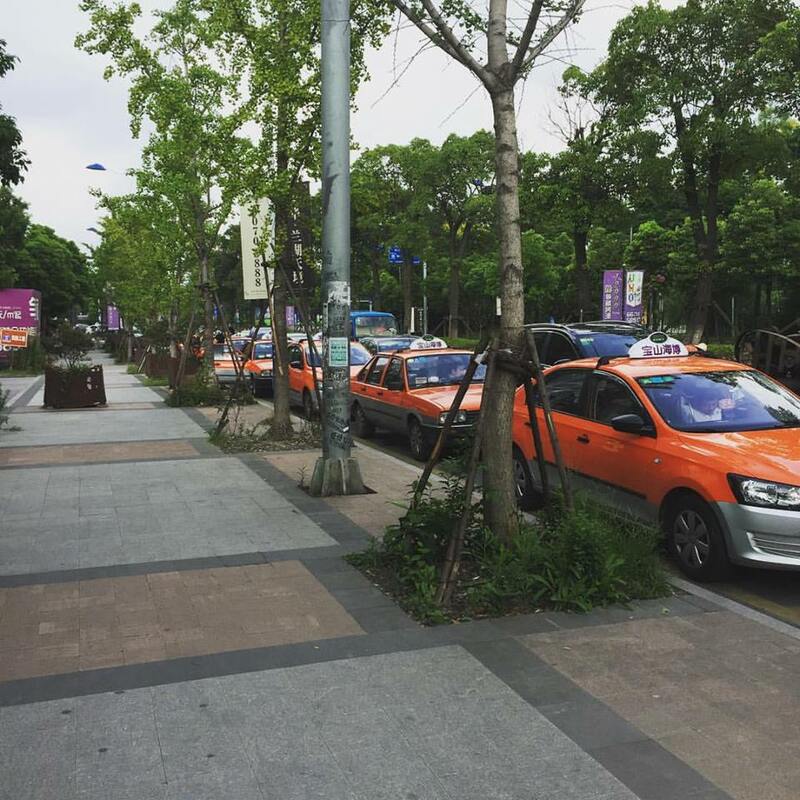 The first thing that we noticed at Meilan Lake was that the cabs were strange colors. This gave me the feeling that we were in a totally different city, which we basically were (although I think that we were still technically in Shanghai). Meilan Lake is a strange place. The lake is fairly big at 49 acres, and it is relatively pleasant if you can get past the weird signs all around it and all of the garbage, which is a little unfortunate. There were boats that you could rent, but Angela and I opted out of that. We had a nice stroll and lunch around the lake. There are some really fancy apartments and condominiums being built near the lake in a Scandinavian style, but everything was completely empty. It was really strange. There was a women’s hospital that was literally a castle, and an outlet mall that was straight out of a zombie film – completely deserted, with only a few high end sporting goods stores that were open. It seemed to me that some very rich person built this community, shops and all, and nobody has moved in yet. I would recommend a trek out to Meilan Lake for the serene lake and for the interesting but bizarre housing development. We have had another great weekend, and are back at it tomorrow. Angela and I are going to be in a teacher only play next weekend, and I am planning on a big bike ride with a few friends. More on that later.